"She said she was wearing Jason Wu...it was Jason Wu for Target." No idea what I'm talking about? Then I suggest you watch this video really quickly before you start your work day! LOL- you know I know that reference--and those shoes are TOTES AMAZE! Haha! hilarious!! Those shoes are crazy cool! The dress is super cute (loved the purses from the collection, too) and your heels are a lot of fun! I want to pet your shoes! Haha, I totally know the video you're referencing...it made me laugh like crazy. This is a beautiful outfit! the dress looks wonderful! and I really love the sandals, great! I wish it would be warm enough for an outfit like this here too! I'm dying over these shoes - they are perfection. So good! p.s. so jealous that this dress fits you perfectly, it barely made it to my mid thigh! 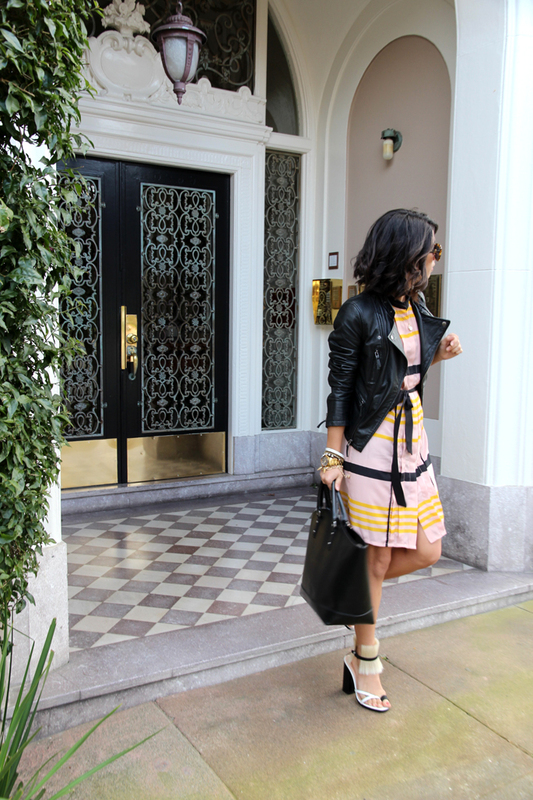 Love how you paired the leather jacket with soft colored dress! And what a beautiful place for pics! lol, the video was super funny; thanks for sharing. great outfit, in love with the dress, stunned by the shoes!!!! I love your outfit!! so cute!! omg I could not stop laughing at that youtube clip. Thanks so much made my day! can't wait to show my friends. I love that dress wish I would have gotten! You rock it well. I feel these photos are styled differently from why we normally see on your blog. Very cool and the outfit is chic! love that dress! i wanted it, but of course it was sold out at my target. looks great on you! Sooo beautiful, love the shoes with the dress! Love that dress on you! I tried it on at Target the morning of the launch, and the colors totally washed me out unfortunately :( Stupid blond hair! But luckily I snapped up the blue floral version, which I'm planning to wear this week to celebrate this gorgeous weather! Beautiful dress and love the heels! Love that dress! I can't believe I missed the Jason Wu for Target dresses. Dropped the ball on that one. That video is hilarous! Love your shoes!!! These shoes are making me giddy! Love them! The dress is simply amazing, the colors remind me of summer sherbet. HA!!! I love that video reference! Fun dress! Those shoes are interesting, in a good way! I love the videos, so funny. Your look gorgeous! Cute outfit.the dress has a lovely shape. Looks well with your brown hair. Just curious; are alot of your friends into fashion too or were you the only one? Beautiful photos. lovely outfit and those shoes are one of a kind. Love the video, and I wish Jason Wu for target haden't sold out in like... 15 minutes. I'm so jealous with the dress. You look gorgeous. That video is so funny! I can watch it over and over again, and I'm so jealous I don't own that dress! shoes are so lovely !! i like your combination !!! LOL....that video was fantastic. i also have this dress but have yet to wear it! Haha knew exactly which video you were referencing, sh*t fashion girls say. Although you have styled Jason Wu for Target really well. I love those shoes!! You look so classy always! hahahahahaha Jason Wu vs. Jason Wu for Target.